So many scholars, from all sides of the spectrum have many theories on why there may be previous structure at the present Tirupati temple. Let us see ourselves the evidences. We are not going to any religious discussion or philosophical discussion, we will stick to the main point, was there a Buddhist shrine at the site of Venkateshwara temple at Tirupati. Indology scholar Romila Thapar told -Dig underneath every Hindu temple, there will be a buddhist temple. If we take example of Adil shah of Bhamani Dynasty, his court poet farishta tells the king demolished more than 300 major temples in karnataka and built mosques there, even in this case we cannot apply Romila Tapar and say dig underneath every moque that adil shah built, you will find a temple, because many mosque are there which were not built demolishing a temple. The Romilla Tapar comment is pure Indologist leftist leaning. Here she is not providing any proof's, but plain rhetoric. One more claim put forth by Dravidian scholars of tamil nadu. Originally it was a Karthikeya temple and was converted to a vishnu temple. Bala means young unmarried same as Kumar(sanskrit) and Kumaran(Tamil) , which denotes to karthikeya ,but in tamil version eventhough he is called kumaran, murugan is married to Devyani(deva army) and valli ( tribal girl). So this argument is defeated there , that the murugan can be called balaji. More than that In South he is called Venkateshwara (Lord of Venkata) and only in north India he is called Balaji and in recent times. First they have to prove that there was a Murugan worship was prevalent in the first millienia in tamil nadu and temples are built for murugan, For this we dont have a answer. second Pallava were ruling in Kanchi upto 9th century AD and tamil kings areas were below the pallava region. Third Tirupathi came under Banas and Nolambas for most part in the first milliena. Both being Kannada Dynasties. So we dont see any murugan temple being built. Since the Kannada/ Tulu version of Karthikeya is Shanmuga. If it was a karthikeya temple, then the kannada kings might have called it shanmuga temple. Fourth and most important Tamil literature right from Sangam works have always claimed that Tirupathi (Thiruvengadam) lies north of Tamil Nadu boundary. So Tamil Scholars dont see much credit in Dravidian scholars argument that Tirupati is a Karthikeya or Murugan temple. Indology and Dravidian scholars who have worked tirelessly to undermine authentic Indian history seems have shot themselves in their foot here. First temples in south India were built in 4th century AD in Karnataka and Andhra. Even in 6th century AD, most of the temples built were Rock cut temples, not standalone temples that we have today. All the early temples like Mamallapuram of Pallavas are also rock cut temples. So a hill temple Hindu or Buddhist standalone in Thirupathi is unthinkable. When was Tirupati temple built. The Purana Accounts are legendary and is not helpful in finding the probable date of the temple. Puranas concentrate how Vishnu came voluntarily to take his place there. Varaha temple at the foothills of Tirupati predates venkateshwara temple at the top. The only account relavant here is Tondaman (pallava) started the worship of vishnu here. This Thondaman assisted his brother(Akasa Raja) in administration. Thondaiman had a foster daughter in Tirupati and she was married to venkatesa. After the death of Akasa Raja (left a young prince), he and his nephew fought and tondiaman felt very weak ,so got the weapons from venkateswara . The war ended Indecisively and the country was divided into two. The one closer to Vengadam (Tirupati) was given to thondaman and the other farther away given to his nephew. Tondaiman built the temple and started the festivals. This Tondaman lived in Kaliyuga. There is a separate Thondaiman dynasty post 12th century AD. But Dravidian scholars want to identify Thondaiman as Pallava. We dont comes across any mention of temple in the vengadam (Tirupati) hills. Tirupati was on northside of the boundary of Tamil speaking region. Beyond this region vadukar lived with Thirayan as the chief and people spoke a language not understandable to tamils. So no help in determining when the temple was built. 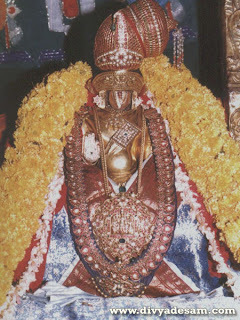 One Alwar called poigai Alwar gives around 12 referrences to temple at Tirupati and Vishnu as presiding deity. Poigai Alwar wrote Naalayira Divyap Prabhandham on the vishnava places. In some places he refers to Ilam kumara koman (May Indicate Subramanya, but the reference here is young fellow). Alwar Bhutan refers to Tirupati and Presiding diety in around 8 references in his works. Pey Alwar also refers to Tirupati. 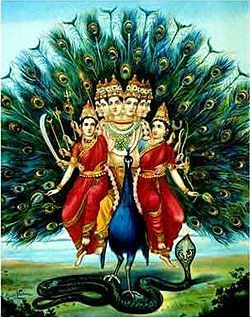 These three alwars considered worshipping vishnu with Vedic rituals as the supreme form of worshp. Some refer to the diety as ardhanari, which refers to shiva. We have to come to the conclusion here, eventhough the diety is referred as ardhanari, it may not be peculiar to shiva alone at those times. And the same goes for Ilam kumaran , may not be peculiar to subhramanya. Even though we come across stray references , we are given solid references to prove the diety is vishnu, so we should not vacillate in our judgement that the diety is not vishnu. Ardhanari shows that the temple is equally important for Lakshmi. So all the early Alwars refer to Tirupati and Vishnu diety. Tirumalisai (Bhakti sara - Sanskrit) contemproary of these three alwars wrote that he has seen all faiths and only found vishnu as great. Now we have to date the Alwars ,which is again controversial. That requires a whole article. But let us try. There is a reference to vairamegha in the early alwars work, that seemed to be identified as Rastrakuta Dantidurga, contemproary of Nandivarma pallava. But the identification needs to be proved. Commentator of Alangara kranta named Yapparungulam belonging to 11th to 12th century AD claims he is desciple of Poigaiyar (poigai alwar)and quotes two stanzas from the authors work. Tirumalisai is dated to 11th century AD. But one thing we can say is all the Alwars were born after the temple were built which was already famous. 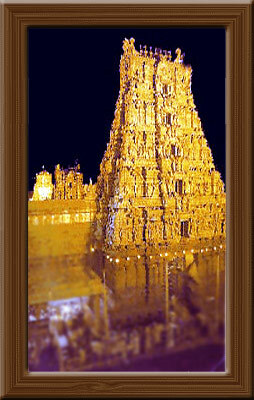 Silapadigaram a buddhist work tells that Tirupati is Vishnu temple. In this story a Brahman of Mangadu in Malainadu goes to Tirupati and Srirangam and sings in praise of Vishnu.The Tirupati is said to be so famous that people from west coast also went to the temple. So this buddhist epic tells very clearly that presiding diety of Tirupati is Vishnu. Dating of cilapathikaram is controversial, we have already seen in a separate article. So let us find who this thondaman is? We find from Sangam literature sources that Vengadam changed hands from kalvar chieftain pulli to Tondaman before the time of pandyan king who won a great victory in Talaiyalanganam. The King who won in Talaiyalanganam is mentioned in Sinnamanur plates dated to 11th century AD and kings mentioned just before this date. The same source says Tondaman ruling from pavattirai (Nellore Dist, AP). We have one more Thondaman Ilam Thirayan ruling in Kanchi. Now the Foster Daugher born to the Tondaman is not legitimate and he is said to have found her on the hills and later finds out that she is his daughter. This has been equated with Naga princess story of karikala. But Karikala meets Naga princess in outskirts of Kaveripattanam, not in Tirupati hills. So we cannot identify Tondaman with karikalan. 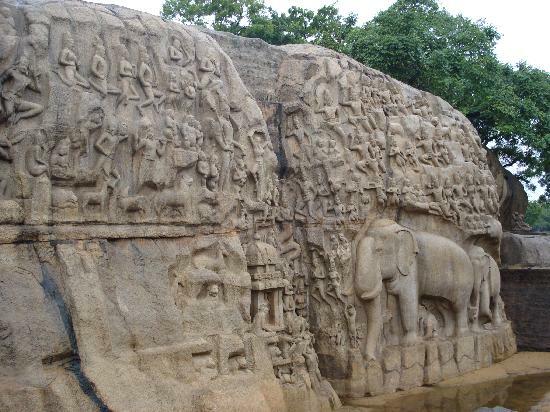 But there is a pallava story of Pallava marrying naga princess in an inscription in kanchi as well. Perumban Arupadai which gives specific details about Kanchi Vishnu temple of Thondaman Ilam Thiraiyan is silent on Tirupati or association of thiraiyan with Tirupati, so we cannot link these two stories. Thiraiyan had a brother and nephew. He fought with the Nephew and uncle for the throne. Alwars talking about war between southern king (pandya) and Northern ruler (pallava). The Tirumangai Alwar says that the Thiraiyan kanchi was occupied by one vairamegan. The vairamegan is suposed to be Rastrakutas. Two Rastrakutas occupied the capital one is Dandidurga and other Govinda II. This story of fight between brother and Nephew looks similar to Kampavarman pallava(relative of Western Gangas) and his kid brother Nrptunga Pallava(relative of Pandyas and also Rastrakutas). This story can reveal the struggle between the last war of succession in Pallava Dynasty before Aditya Karikalan unsurped the throne. Uttaramallur by Nandivarman pallava II is the first inscription to refer to vengadam, there is no temple here still. The hill is just mentioned as Vengada ,not Thiruvengada(Sri Vengada). In 8th and 9th centuries AD, Many Visnu temples near Tirupati received Grants from many kings, but none was given to Tirupati temple. But the same can be said about Buddhist or Murugan or Jain Temple , Kings at that time were secular, so there should be a grants even if it is any of the other holy places. In TTD gives eleven inscription of pallavas. Earliest belong to Dandivikramadeva , which may correspond to period 833-34AD. Even through many scholars claim many dates for Tirupathi temple construction, First Inscription in Tirupati temple is by Dandivarman pallava(830AD). So the Temple has to be built during that time. Point is the debate about Tirupati is not just today ,but it is there right from 11th century AD. 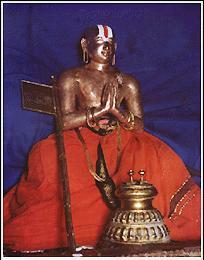 Ramanuja made arguements to kings to establish the primacy of Vishnu in Tirupati. For this we have to establish the date of Ramanuja. There was a Vaishnavite Devotee called as Nadamuni. He belongs to Mannarkovil in south Arcot district. He spent most of the time in the village and sometimes in Kurukaikkavalappan Kovil, a nearby village, which was just mile after the chola capital Gangaikonda Cholapuram (Named so,After Western Ganga Territories were absorbed into chola empire in 1022AD). when he was in Kurukaikkavalappan Kovil village, he heard vaishnavite devotees singing a song in praise of Vishnu, which was Tiruvoimoli of Nammalvar. He asked the pilgrim to repeat the verses. But the pilgrim knew only ten lines of the 1000 lines poem. So he went in search of the work. He reached Kumbakonam, he got nothing. So he went to Tirunagari in Tirunelveli the native place of Nammalvar. His attempts were futile there also. So he sat under the tree of temple ,where Nammalvar is supposed to have practiced Yoga. He chanced on someone who was direct disciple of Nammalvar and got the full work. He brought the work to srirangam and revived the festival started by Thirmangai Alvar. Having done this, he went on pilgrimage to all the vaishnava shrines in the country. He went to Abhobilam and Tirupati. He went back to Tirupati as he welt the pooja arrangements were not proper. His grandson Alavandar Yamunait- turaivar or Yamunacharya. For the arrangements to become proper, he asked one of his disciples to volunteer to stay in the hill and conduct the worship in proper way. One of his grandsons Thirumalai Nambi volunteered to do the service. Thirumali Nambi settled down there and planted a garden and took upon himself to deliver water for the diety daily from a waterfall little distant from the temple. One of the young sisters that Thirumalai nambi took with him was married to one Kesava Somayaji of Sriperumbudur. The offspring of this marriage was Ramanuja. Ramanuja's date of birth, according to the traditional account of his life,is Kali 4118, A. D. 1017. The other date given of course is Saka 937 bya chronogram. Going by the story we have here ,the date has to be at the fag end of 11th century AD. The same sources give date of Nadamuni to 3684, which would mean A. D. 582-83. So these date cannot be trusted. Ramanuja visted the tirupati temple once in his chilhood. The temple after Thirumalai Nambi was managed well except during one time of Gopinath. The local ruler Yadavaraja found some dispute between Shaivas and Vaishnavas regarding the temple and called in court the warring parties to settle the matter. Ramanuja explained clearly that the temple is vaishnavite and the matter was settled that the temple was Vaishnavite. And the Vaishnavites were given more unoccupied land in the base of the hill for settlement. So through the discussion we have seen that the Ramanuja is in 11th and possibly extended to 12 century. So the earliest dispute seems to be between Shaivites and vaishnavites, which has been decided in favour of Thirupati being Vishnu temple. The Conclusion is that the Tirupati is a Vishnu temple all along. Since the temple has been built in 9th century AD. It is after 9th century AD that the hill is said to be holy place. So any account which says that the hill is holy(sri or Thiru venkata) is after 9th century AD. This applies any work or devote singing on Tirupati. The dispute seems to be primarily between Shivite and Vaishnavite, because of the Shiva Temple at the base of Tirupati which predate the Tirupati temple. Indologist seems to have introduced some confusion here. There are no inscriptions about Tripati temple, before 9th century AD, because the temple did not exist then, not because it was a Buddhist Shrine. interesting. visited this temple just a week back. Every temple has a history ,if you read the sthala puranas, you will be amazed the number of legends of these temples. Brahmanda Purana refers Tirumala as Venkatachala. which occurs in the chapter 4 on “ Greatness of tha Venkata mountain”, which occurs in the midst of the discussion between Lord Brahma and sage Narada which occurs in Brahmanda Purana. This Brahmanda Purana is documented before Kaliyuga and this is verified by Indian Indology Center & Other research. slokas & Mahatmyans about lord Venkatesha showing the name Venkatesha & Srinivasa and Seshadri and venkatachala (Tirumala hill as hill of venkatesha). The Varaha Purana & Aditya upa-Purana explains glories of Lord Sri Venkatesha and Tirumala Hill, How the hill is formed & why is lord Maha Vishnu staying on this hill etc. Everything was already mentioned in 12 puranas before the start of KaliYug itsself. 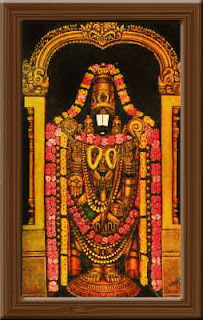 Sri Vemkatesa Mahatmyam As Part Of Aditya Puranam & was told to all Rushi's by Suta Maharshi..
Markandeya purana mentions Sri Venkateshwara Vajra Kavacha Sthothram. These Puranas is documented before KaliYug and this is verified by Indian Indology Center & other research. puranas we have today are between 3rd century AD to 11th century AD. @Moda Sattva.....Puranas are documented by Sri Veda Vyasa. The great truth what Sri Veda Vyasa saw by his special power he had to see the past present and Future Truth, those Truth Sri Veda Vyasa had documented in Puranas and Vedas. Puranas was not just written by some one. Between 3rd century AD to 11th century AD many puranas was rewritten(copied) to make many copies because that time xerox or Printer was not there, so by rewriting the same thing another copy was made. By this procedure many copies of Puranas, Vedas and Bhagavad Gita was made but the original slokas remained the same. The original words of Brahma, Narada, Bhagavan Sri Krishna, shiva, Vysista Maharshi, markandeya rishi remains the same in all the puranas. Check any Bhagavad Gita any where, 700 sanskrit original slokas will remain the same but only the translation get changed little bit from acharya and sampradaya but original slokas remain the same. We can talk only about what we have now. We have about three or four versions of Brahmanada purana your mentioned, each version have some additions. With advent of invaders from outside, the people who have revised the ancient documents have to migrate out of their comfort zone and in the process have added errors under pressure from breakdown of Guru shishya tradition or rulers of regions they migrated. So apart from the main content, many other things are open to question. I stopped reading this when I saw Silapathigaram mentioned as a Buddhist work. Can you please provide more explanation on that? There has been information circulating even on Wiki that Pallava Queen samavai of 614AD has donated Idol to Tirupati temple. the easy method to find out the truth is allowing the public to see the venkateshwara deity without any clothes (vasthrams)or metal covers (kavasams) during abhishekham. he must be in a kowbeen (linen cloth) we can check whether he has any rudhraksha in his head as palani murugan wears. doubt is coming when his fore head and nose is covered with out of proportional size "namam" (sricharanam) with silver or gold which is hindering in seeing his forehead clearly. There are many strong evidences that Shaivism took over Jainism and Vaishnavism took over Budhism in India between 3rd and 10th centuries. Hence Asokan's argument is very valid if you have to be proved right. Why a statue cannot be shown in natual form is a million dollar question? First, apart from Satavahan, Ikshvaku, Vakataka (only Harishena) and Vishnukundin Dynasties, there is not much argument for state patronage of Buddhism in South India. None of these dynasties ruled Modern Day Tirupati. The Pallava dynasties which ruled these areas for much of the time, is Jain. And if you look Mahendra Varma pallava, he makes fun of Buddhism in Matta vilasa prasanna. So the whole statement, "there is a buddhism before vaishnavism in South India between 3rd and 10th century AD" is false. Go to date of Devaram Trio, you will get to know more on this. Showing the statue in natural form is not a million dollar question. Will it convince you to accept the results is the million dollar question. Is there any vaishna temple having tradition of head shaving and ear poring? I do get see where you are coming from. somebody has told these are not vaishnva rituals so the diety is not vishnu. These traditions are Indian traditions they are present in all Indian religions be it Hinduism, Jainism or Buddhism. Today even christians, muslims do all these rituals in their holy places. Interresting was the topic.., kindly reveal me the story of Govinda Raja Swamy, just not about the temple, but about the god..
Buddha is incontrovertibly believed to be born about 2500 years ago. He is further believed to have tried the Hindu way of life and failed in attaining enlightenment and at last his enlightenment under the Bodhi tree has unfolded the 8-fold path as the essence of Buddhism which more or less ignores all the rites and myths and caste beliefs of Hinduism. 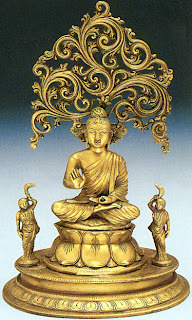 Thus Buddhism was born when Hinduism was already a living belief in many parts of India. 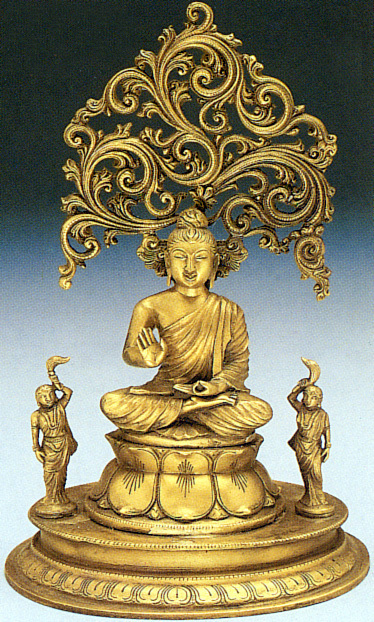 Only after Ashoka of the Mauryan dynasty began spreading Buddhism in all parts of his empire in India besides other countries with which he had trade and other relations, Buddhism attained an all- India presence. Hence to say that underneath every Buddhist temple there is a Hindu temple is a statement borne out of sheer prejudice not based on historical or archaeological evidence. Thapar and many other Western and modern Indian scholars led the former have developed a deep-rooted prejudice towards Hinduism for unjustified reasons best known to them. No historian of any worth can explain the history of India without considering the role of Hinduism. This is not to say whether Hinduism is all-virtuous as made out by staunch and orthodox Hindus. For history and historians, it is explanation of the historical train of events and not the justification of one or the other beliefs that is important. Tell me wheather it is murugan or vishu because many Tamil literature States that it is murugan, why the original statue is not shown to public, if it is vishu why it is not shown. Hello, Nice to see that blog commenting done right still has many benefits. Thanks for sharing your insights. How about Sri Adisankaracharya placing Srichakra at at the lotus feet of Lord Venkateshwara in tirumala. Does it helps for knowing the time. Kalbhras are a myth, they just creation of dravidian scholars to predate the literature. Read myth of Kalbhras invasion and rule. Anyone come and see caves in Maharashtra you will find that Buddhism reach all over India... Reveal the statue...all will know... Either jain or Buddhist because there is tradition in buddhism to shave all hair on head..but others don't..
namaH. VirUpAkShA is Shiva’s name.